Save the date for our district Cub-o-ree, which will be held from September 27-29 at the Miller’s Pond area of Dan Nicholas Park. This year’s theme will be “Nature Calls,” with activities including archery and BB events. 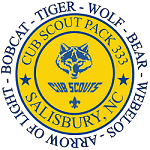 Registration fee per Cub is $10 (includes patch and Sat. hot dog lunch).